This statistic shows the gross domestic product (GDP) per capita in Russia from 2012 to 2017, with projections up until 2022. GDP refers to the total market value of all goods and services that are produced within a country per year. It is an important indicator of the economic strength of a country. 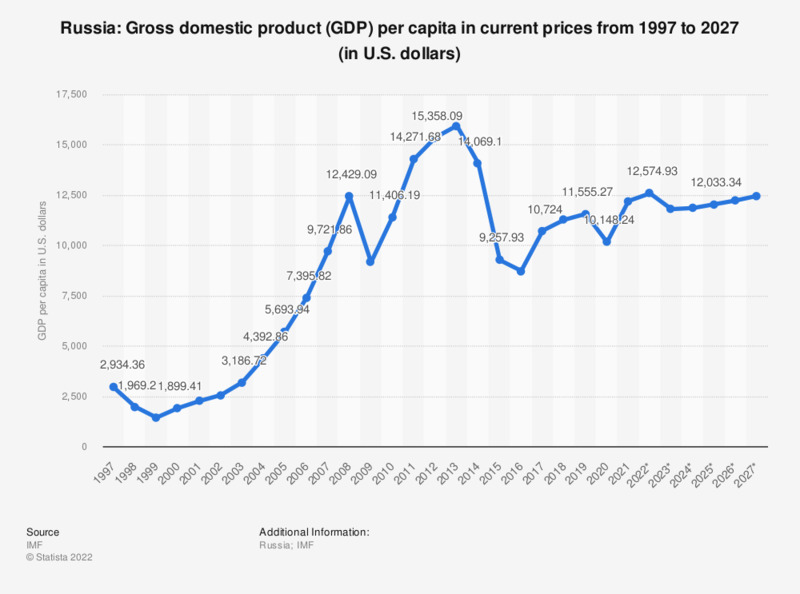 In 2017, the GDP per capita in Russia was around 10,955.79 U.S. dollars. See the Russian GDP for comparison. Russia generates most of its wealth through its energy sector, given that a large percentage of its industrial and agricultural sectors have been privatized in the 1990s. The majority of Russia’s exports consisted of natural resources, such as oil, gas and metals. Russia’s primary export partners are located within Europe, with the exception of China, and are often the recipients of a large amount of Russia’s natural gas exports. The country’s second most important and influential sector is the military sector, due to having built up a complex arms industry and having the proficiency to produce high tech weapons. Russia ranks as one of the highest spenders for military production and is one of the more intimidating military powers in the world. Due to the privatization of Russia’s industrial and agricultural sectors, a rather large part of the population was able to capitalize on the market. Russia is home to one of the highest numbers of billionaires in the world, trailing only countries such as the United States and China.